Find all the best deals here! We'll be updating this page throughout the day. Boxing Day is a big deal for our UK and Canadian readers, and we've scoured the net looking for the best Boxing Day PC gaming deals as we near the end of the year. You'll also find some great US PC gaming deals on this page too. Did you forget something, or perhaps you missed out? Box up that ugly sweater and take it back, and use the proceeds to get what you really want. 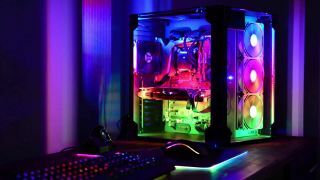 Whether it's new PC hardware or a new game, we've hand-picked deals to make sure they're something we'd buy ourselves, and that they're actually selling for deep discounts compared to their normal pricing. The Logitech HD Pro Webcam C920 is $46 on Amazon ($54 off). This is our favorite webcam, so if you're looking to get started in livestreaming, this is a great price. The Oculus Rift is discounted to a decent $349 on Amazon US and £349 on Amazon UK, and each bundle includes the controllers and a bunch of games. This matches its Black Friday price from November. The Intel Core i7-8700K is reduced to £350 today (save £60) on Overclockers which is a good UK price for this CPU. The Samsung 850 EVO 250 GB SSD is discounted to just $85, matching its Black Friday sale price. An SSD will significantly boost your load times in games, and this is great value. 512GB Crucial MX300 2.5" SSD: £110, Amazon. Incredible value for 512GB of solid state storage. SanDisk SSD PLUS 480 GB Sata III 2.5-inch Internal SSD: £106, Amazon (save £19). The 240 GB version is also discounted, albeit by less. We're expecting awesome deals on gaming monitors. You can check our best picks in our group test, and see which ones we think are worthy to get. Last year, monitors received some of the best discounts, and we're expecting more of the same this year. We just updated our Best gaming monitors guide with all current and discount pricing. Asus ROG SWIFT PG279Q 27-inch monitor. $749.48 on Amazon (save $50). It's not a massive discount, but for the best gaming monitor, with a 165Hz IPS display 4ms, 1440p, and G-sync, that's not bad at all. This LG 27MU58-B 27" 4K monitor with FreeSync is $315 with (promo code BF17FLYER36). That's $175 off. Great price for a 4K monitor. LG 27UD58-B IPS 4K UHD Free-Sync Gaming Monitor, 3840 x 2160: $399.99 on Newegg (save $150). A great monitor at its lowest ever price. 16GB (2x8GB) G.Skill Trident Z RGB DDR4 3200: $279.99, Newegg (save $29). Not the biggest discount, but a solid price for some of the best DDR4 RAM you can buy. 16GB (2x8GB) G.Skill Trident Z RGB DDR4 3600: £259.99, OverclockersUK (save £30). Other G.Skill memory is also reduced. Seagate Backup Plus 4TB portable HDD USB 3: $100, Amazon (save $30). This is a pretty low price for a 4TB portable drive. A decent choice for back-ups. Gigabyte GA-Z170X-Gaming 7: £119.99, OverclockersUK (save £80). It's not as huge a discount as it seems because OverclockersUK's price is usually high, but it's still a good price. It's part of the same family as the Gaming 7, which we named the best entry level motherboard. Overclocker's Kin'yobi VR Gaming PC is £1400 at Overclockers (save £200). Featuring a Ryzen 7 1800X, GTX 1070, 16GB of DDR4, and a solid complement (250GB SSD + 2TB HDD). We can get behind that. HP 250 G6 i5Laptop 2SY46ES Work Laptop: £450, eBuyer (save £50) - Nicely spec'd, super quick work/school/uni laptop, not gaming. Microsoft Surface Pro 12.3-Inch PixelSense Tablet PC (Silver/Black): £569.99, Amazon (save £230). A mega discount on one of the best tablet/laptops around. After a fantastic ATX case on the cheap? The Fractal Define R4 Midi Tower is one of our favourites, now available for £65, that's a £30 saving for one legendary ATX chassis. Available from Overclockers UK. Rosewill Mechanical Keyboard with Cherry MX Red Switches: $74.99, Newegg (save $45). Corsair Gaming K70 LUX Mechanical Keyboard with Cherry MX Red Switches: $109.99, Newegg (save $50). Logitech G213 Prodigy Backlit Gaming Keyboard: $44.99, Newegg (save $55). Razer Blackwidow Chroma V2 Mechanical Gaming Keyboard with Green Switches: $189.99, Newegg (save $60). Cooler Master MasterKeys Pro S Mechanical Gaming Keyboard with Cherry MX Red Switches: $114.99, Newegg (save $75). G.SKILL KM570 RBG Mechanical Keyboard with Cherry MX Silver Switches: $106.06, Newegg (save $53.93). Save £20 off this Steelseries Rival 700 gaming mouse. Now available at Overclockers UK for £45, that's a 30% saving. It's £5 above its Black Friday sale price, but that's still not too bad. Corsair Glaive RGB Aluminum: $65.99, Amazon (save $34). The lowest ever price for this versatile mouse, which Alex awarded a 95 in his recent review. Not to be missed. Corsair MM800 RGB Polaris mouse pad: $54.99, Amazon (save $35). A heavy discount on the best RGB mouse pad on the market. LG 50-inch 4K OLED TV OLED55C7P: $1,697 (save $500, Amazon) This the 2017 model of LG's class-leading 4K OLEDs. If you're considering running your PC through to a 4K TV in the living, accept no substitutes. Tim on the team owns an LG OLED and absolutely swears by its deep blacks and eye-popping color reproduction. There are deep discounts across the range at Amazon. Samsung 50" Ultra HD HDR Smart LED TV: £465, Amazon (save £124). Amazon has a lot of other Samsung TVs on discount too. Our number one pick for best VPN service is VyprVPN. Golden Frog has VyprVPN for $3.75/month for unlimited data and 3 connections, which is 25% off a month. Fast, secure, and with a huge number of nodes all over the world, VyprVPN is our go-to for securing and protecting your online privacy. Blue Yeti slate: $90, Amazon (Save $41). Our favorite microphone, at a great price. Basically the best microphone for the money. Rad deal. Linksys AC2200 EA8300 Tri-band Router: £105.99, Amazon (save £44). One of the cheapest prices you'll find for a tri-band router. Corsair RM750x, 750W fully modular power supply: $119.99, Amazon (save $50). A solid PSU, and this deal is the cheapest you'll find it. Rosewill PHOTON Series, 750W fully modular power supply: $89.99, Newegg (save $80). Big savings on an inexpensive, gold rated unit. EVGA SuperNOVA 850 G3, 850W fully modular power supply: $174.99, Newegg (save $25). Not the biggest discount but still a good deal if you need the wattage.